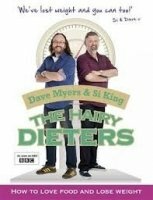 The Hairy Bikers have lost almost 6 stone between them and you can lose weight too... Si King and Dave Myers are self-confessed food lovers. Food isn't just fuel to them, it's their life. But, like many of us, they've found that the weight has crept on over the years. So they've made a big decision to act before it's too late and lose some pounds. In this groundbreaking diet book, Si and Dave have come up with tasty recipes that are low in calories and big on flavour. This is real food for real people, not skinny minnies. There are ideas for family meals, hearty lunches and dinners, even a few knock-out bakes and snacking options. The Hairy Bikers will always love their food - pies and curries won't be off the menu for long! - but using these recipes, and following their clever tips and heartfelt advice, you can bake your cake, eat it, and lose the pounds.